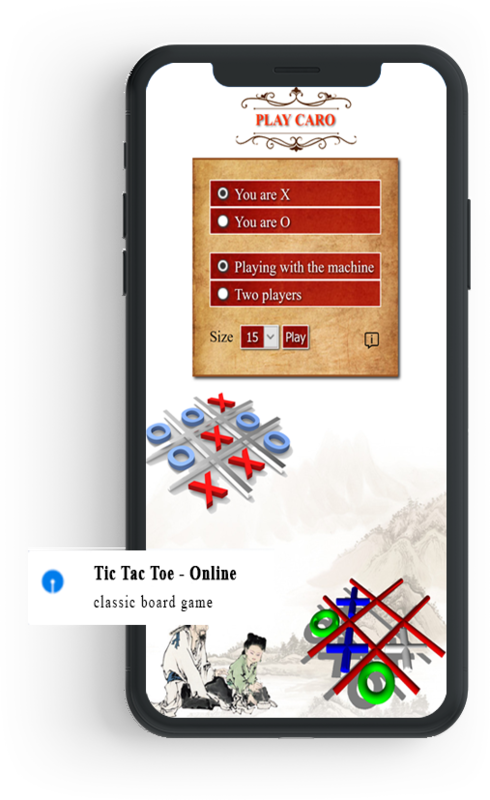 This is the best Chess game on mobile and the game has AI technology application. With powerful chess AI, amusing challenge mode, Chess Kingdom AI will bring you an amazing adventure! - Great graphics and exciting sound effects. - One player with Computer AI. Spider Solitaire is a classic card game that has been enjoyed by gamers who love playing cards and introducing them to friends. The game is attractive and attractive to players in simple gameplay with lively, beautiful and thoughtful cards that are quite familiar in many people's lives and childhoods. The game has a gentle, healthy entertainment feature that helps you relieve your worries and stress in your life. Spider Solitaire offers cards like players, checkers, flanges, scooters and the player's task to arrange cards of the same type in the same order. The game requires the player to calculate, to be quick and careful in the moves to get the cards to its correct position. Caro is a very simple game but requires a lot of clever and clever calculations in the player. This is an intellectual game that is very familiar to each of us. With a simple play but intellectual element is very high, so play Caro Flag is a lot of people love especially students, students and office workers. Game Caro play is not only pure entertainment but a very serious fight. Join the game Caro and beat the opponent to show your level playing chess.